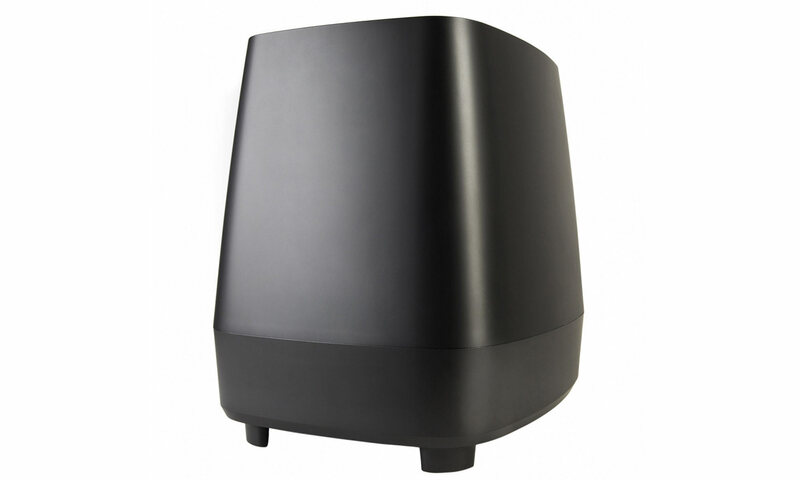 Polk Audio is often seen as a value-for-money brand in its home country of USA. The company recently expanded across the Atlantic to parts of Europe where it will be competing with a more diverse set of brands. Can Polk Audio remain the value-for-money option outside of its home turf? Polk Audio has fairly diverse line-up of soundbars, including the MagniFi range that is available in Max and Mini versions. We are reviewing the MagniFi Max with a wireless subwoofer. I was immediately struck by surprise but was not yet sure whether it was good or bad. The boxes were elegant but surprisingly light. Old-school HiFi nerds would probably scoffs at the mere notion of modern soundbars or anything other than heavy receivers and speakers but in the transition to digital audio technology, it is certainly possible to make more compact and energy-efficient products that sound great, in part pioneered by Bang & Olufsen’s ICEpower initiative. 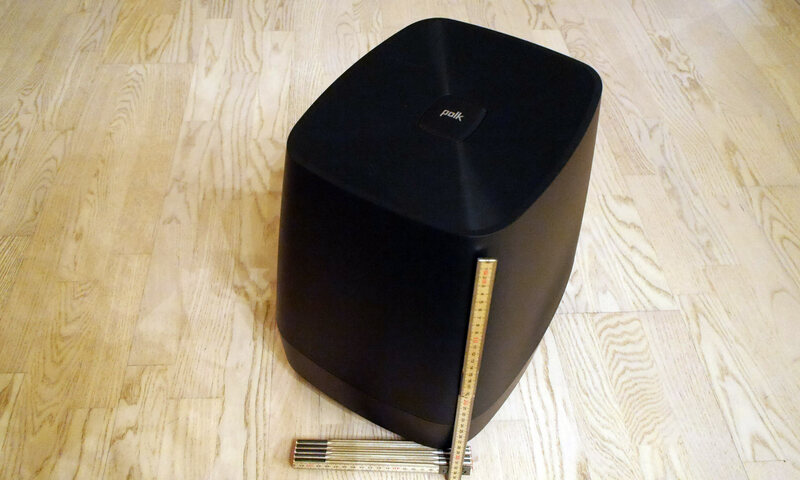 As soon as I started unboxing the components, it was clear that Polk Audio has found inspiration with some of the giants of the consumer electronics space, and decided that the unboxing process should be elegant and nice. Everything is neat and orderly inside. A good first impression. In the box, Polk has included all of the accessories and cables that you need to get started, including an optical audio cable and an HDMI cable. Most recently, I tested Sony’s Dolby Atmos soundbar that sells for double the price of Polk Audio’s Magnify Max, and Sony had chosen to still not include an HDMI cable. Polk Audio has a clear idea of the type of customer for this product. 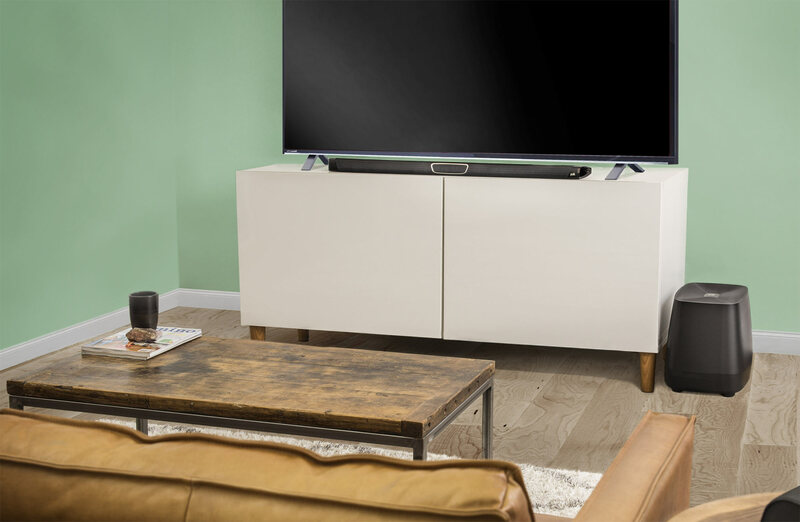 People who invest in their first soundbar want something that is easy to set up – a plug-and-play solution. Inside the box is a small remote control that matches the design of the soundbar. It has an elongated shape with soft corners and a somewhat chubby appearance, which makes it nice to hold and operate. It has several handy features despite its simple button layout. The remote control obviously has buttons to regulate volume but it also has dedicated buttons for adjusting bass intensity as well as something called ‘Voice Adjust’, which enhances human voices by adjusting volume in the 100-250 Hz frequency range, where voices typically fall. We will get back to this later in the review. 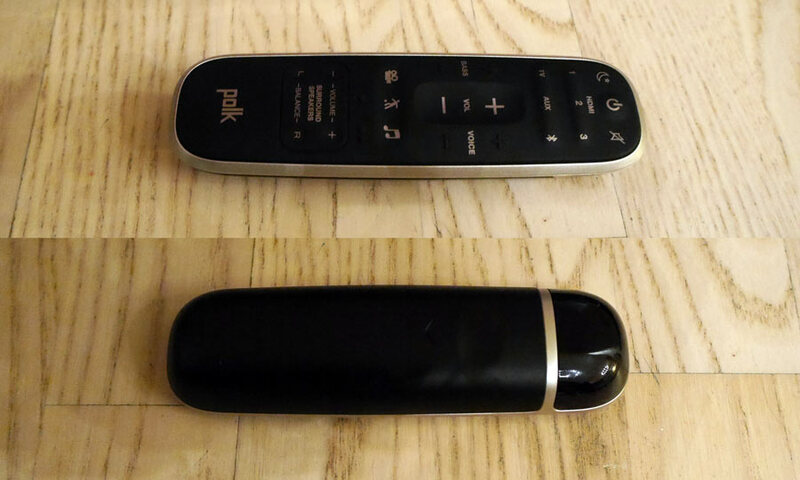 The remote control also has three buttons at the bottom dedicated to Polk’ audio modes: Movie, Sports, and Music. 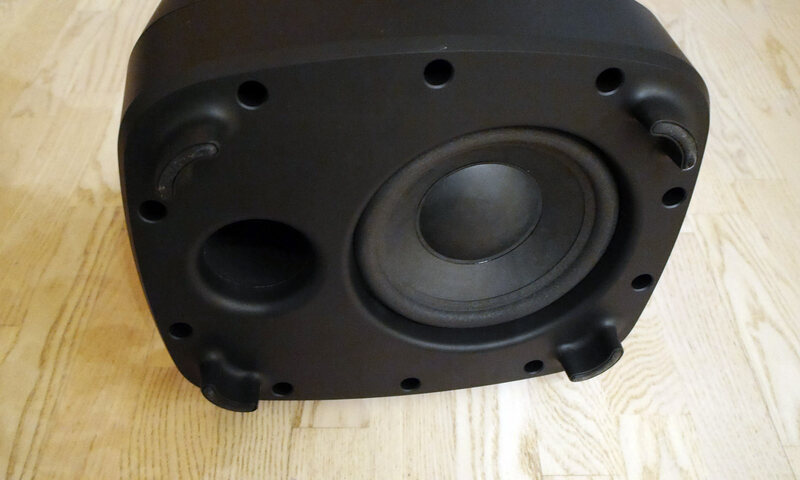 The subwoofer is suspiciously light in weight, as if it was a hollow plastic encasing. If you turn it around you will see a speaker unit enclosed in a foam membrane. This makes it lighter in weight but also requires a small magnet. This construction explains why it feels so very light. 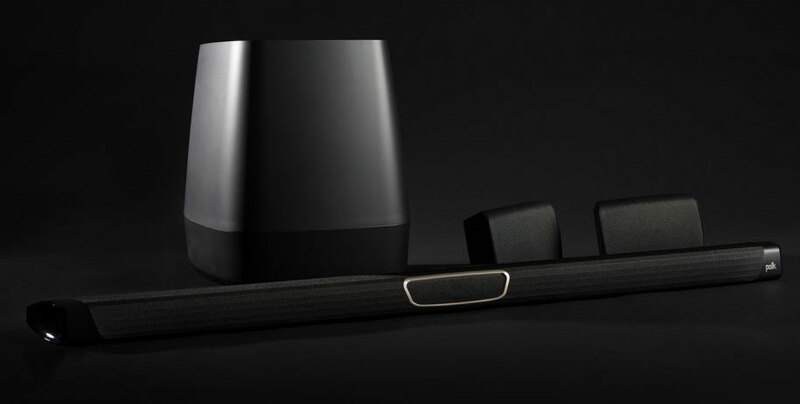 The soundbar does not have a lot of weight to it either and has been designed to complement the soft, rounded shapes also found on the remote control and subwoofer. I think it is breath of fresh air compared to other soundbars that typically follow European and Asian design traditions with minimalistic, sharp lines and edges, literally. The soft, rounded look that Polk Audio has opted for may not fall in line with your TV’s design but sometimes you need something to different to complement a look. The soundbar is black so in that sense it should match up with most TVs. There are no small design details to touch on. 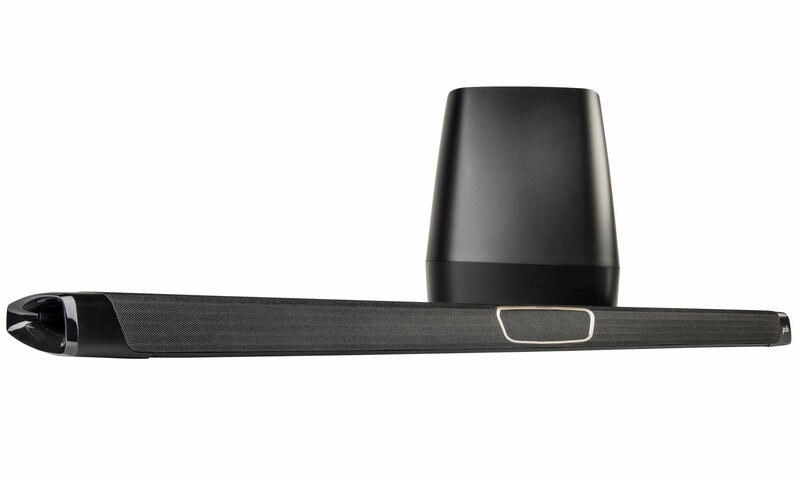 The middle segment of the soundbar is made from plastic to indicate where the center unit is located – in case you were in doubt. On top of the soundbar we found a few small buttons: Bluetooth, audio volume, and input. Around back we found three HDMI inputs that are capable of 4K HDR pass-through as well as 1 HDMI output with ARC (Audio Return Channel). The HDMI output is used to connect the soundbar to the TV, which left us with 3 HDMI inputs for our UHD Blu-ray player, Apple TV, game console, set-top box etc. If you have a lot of devices, you will quickly run out of HDMI inputs. All three HDMI inputs support CEC (Consumer Electronic Control), which means that the TV and soundbar can communicate in order to adjust audio volume via the TV’s remote control. This works as intended and allows you to put the soundbar’s remote control in a drawer. However, you will still need the bundled remote control if you want to change audio mode or HDMI input. Even though few TV manufacturers boast about having HDMI CEC, it is supported by virtually all TVs today. Many of them try to claim it as their invention by giving it a funky name such as Bravia Link (Sony), Anynet+ (Samsung) or SimpLink (LG and Philips). This causes a lot of confusion but it should work regardless. If it does not work, check the settings menu on your TV to see whether it has been enabled or not. 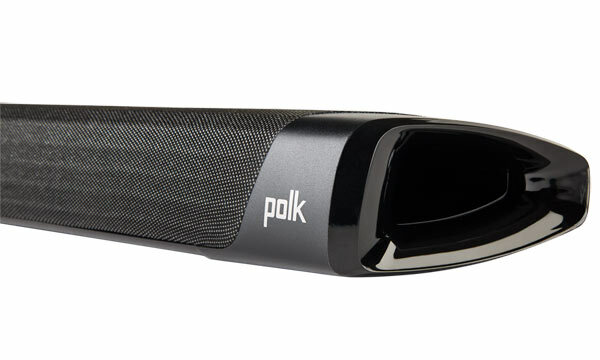 Three HDMI inputs is, for us, at least one too few, especially considering the price point of this Polk Audio soundbar. One or two extra HDMI inputs would have alleviated the situation for many users. Of course, if you prefer to use the built-in apps on your TV, you may find that it is enough so in the end it depends on your setup and preferences. The soundbar also features an optical audio port, analog AUX – also called mini-jack or 3.5mm jack – and an Ethernet port. In addition, you can connect via WiFi to take advantage of the built-in Chromecast feature, which you should prefer over Bluetooth for music playback. 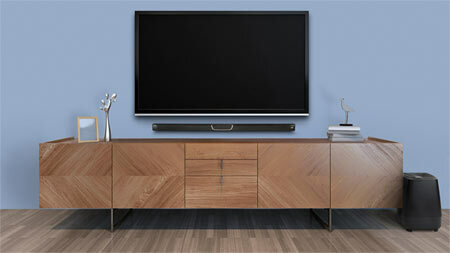 Soundbars typically cater to buyers who seek a simple and convenient solution for the living room TV. It follows that a soundbar must be easy to set-up and intuitive to use. 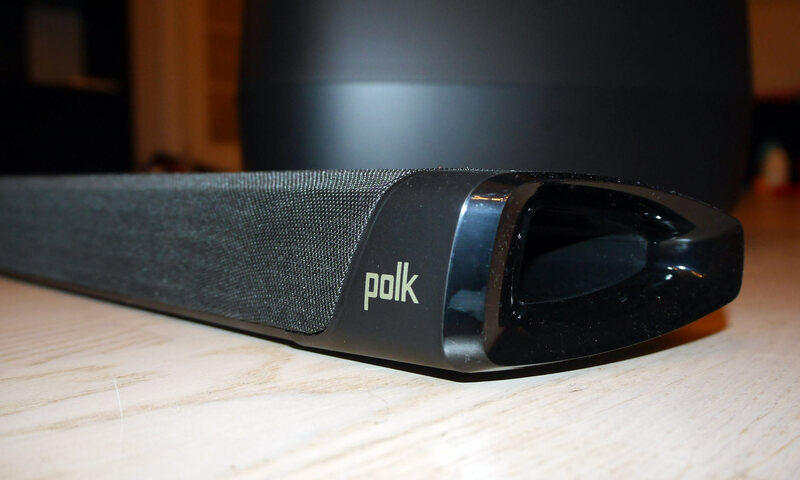 Luckily, Polk Audio’s MagniFi soundbar hits more or less all those nails on the head. There was no trouble pairing the soundbar and subwoofer. You do not have to go through an app to set-up the product either. You simply connect it to the power outlet and press the ‘On’ button. HDMI ARC (Audio Return Channel) works impeccably. There is no display or menu system. Polk has stuck to the basics. 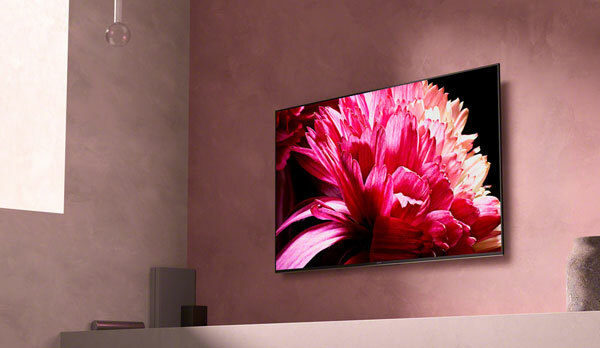 The soundbar supports pass-through of 4K, HDR10, and Dolby Vision, so at the time of publication it is updated to handle the relevant video technologies. However, it lacks the latest audio technologies such as Dolby Atmos and DTS:X. We are looking at a conventional 2.1 soundbar so Atmos support would not make much of a difference. If Polk were to include those audio formats it would also need to pack in extra units and technology, which would increase the price point. 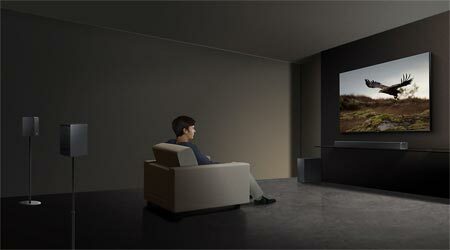 MagniFi Max offers three different audio modes and the idea is obviously that ‘Movie’ be used for movies. This is not very different from modern TVs that also offer a handful of picture modes. To get things going I used a classic test movie (Transformers) that is suitable for testing several aspects of a soundbar’s performance. Transformers has lots of explosions and ear-catching effects such as metal-against-metal. MagniFi Max delivers heavy bass that controls the lowest frequencies (Hz) without much distortion. In Transformers there are plenty of scenes with explosions and cars accelerating where the deep bass can be felt in the stomach region due to the high air pressure from the small lightweight subwoofer. It is a wolf in sheep’s clothing. The bass, however, lacks precision in several areas and it is evident that Polk has made some conscious choices here. Sound effects that were meant to be tight and end abruptly often continue to rumble a little too long. Not by much but it is noticeable. It is always difficult to strike the right balance but the American company has prioritized raw power over finesse. Raw power certainly has its appeal. It is exciting to witness and I can understand why some viewers seek this kind of voluminous bass performance. Movies and TV series are meant to entertain so many viewers will probably accept that a little precision gets sacrificed in the process. The upper treble range that includes lots of sound effects during movies and TV series also performed well most of the time. It delivers adequate volume and it manages to position sound effects well in my listening environment, meaning that sound effects that are supposed to be right in my face can be discerned from background sounds. However, the tweeter unit has a tendency to lose its breath relative to the bass, especially when you crank up the volume. I was never able to find a proper setting to strike a good balance between the two. The treble sound range simply lacks some width and dimension at high volume levels. One option is to change the soundbar to ‘Sports’ mode, which prioritizes treble sound and reduces bass but this leads to a situation where the tweeter often sounds somewhat distorted when approaching the upper volume range. Again, the balance is not optimal. I was not entirely convinced about mid-tone performance either. I was hoping that Polk Audio’s ‘Voice Adjust’ setting option could help alleviate the situation but alas, no. 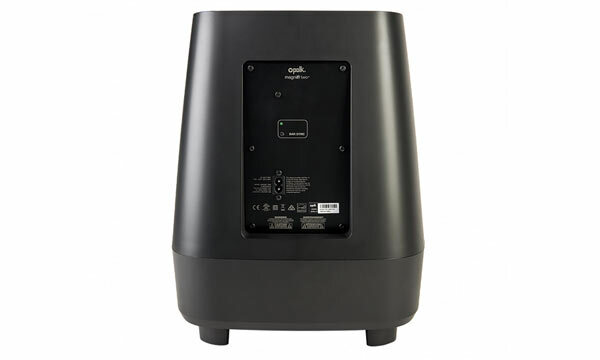 The setting option lets you up- or down-prioritize the mid-tone range in frequencies from around 100 to 250 Hz where human voices often fall but even though it is smart feature to help fine-tune to what degree voices are heard in the mix, the hardware in MagniFi Max lacks some juice and power. Near the top end of the Voice Adjust function’s volume setting – around 4 out of 5 – is where we would usually prefer human voices to be, and with that taken into consideration, the feature leaves very little extra room for adjustment and is certainly less useful than Polk Audio makes it out to be. Voice Adjust cannot change the fact that the quality of human voice reproduction is not there. In this area MagniFi Max leaves a lot to desire. In 12 Years a Slave I found myself yearning for intensity and spirit in voices, and all of the the small details that help convey fear or joy. I am not suggesting that everything sounds neutral – of course MagniFi Max can reproduce some of these effects – but it lacks richness and detail compared to some of the top soundbars in this price segment. To summarize, I think that MagniFi Max is an excellent companion for action movies and TV series where you want deep and explosive bass. For drama and other genres it lacks finesse and precision in especially human voices. In the beginning of the review, I said that Polk Audio is often considered a value-for-money product in its home country of USA. You can even expand MagniFi Max with the ‘SR’ rear speakers, which will cost you around 550 dollars for the full set. In Europe, the same configuration will set you back 750 Euro, which is a little less attractive. So, my main challenge here is actually to position MagniFi Max relative to the competition. It seems like a better proposition if you reside in the US. When you are watching live TV, and TV channels in general, audio tends to be more compressed than when watching Blu-ray. It is also a different discipline where other factors come into play. Because sound is more compressed, it is also a more forgiving. Even on a good audio system, it will sound less than optimal whereas a pristine soundtrack on a Blu-ray disc will push the soundbar into awkward positions. As a soundbar for TV news, sports, and mixed TV programs I would say that Polk Audio’s MagniFi Max performed relatively well. I probably prefer the ‘Sports’ mode as it enhances voices. There are two things that I took note off. First of all, as a viewer you should not be forced to change between audio modes. You should not change between picture modes on a TV either. This simply serves as a way to hide inadequacies in the product’s hardware. The optimal solution is to have a soundbar that follows the reference and delivers neutral sound, leaving it up the movie or TV audio technicians to decide how their respective sound universe should be experienced. If you have a hard time hearing what the actors say it can possibly be traced back to one of two reasons. 1. This is what the content creator intended. 2. The quality of the mid-tone or treble unit is not good enough or powerful enough. In the latter case, I can understand the desire to include a Voice Adjust setting to enhance voices but rather than putting a lot of effort into a patch solution I would argue that the manufacturer should address the problem at its root by implementing better units, drivers etc. The second thing is the fact that Polk Audio appears to have implemented a “reverse” Sports mode. Normally, you would want to engage a Sports mode to tone down commentator voices in order to better feel the crowd ambience. Of course, you can use the Voice Adjust to tone down voices, if you want. But to get back on track, MagniFi Max forces you to set it up to ‘Sports’ mode to fully enjoy its strengths when watching live TV. If you forget to change over from ‘Movie’ mode you will get muddy voices that tend to drown in bass and just a weak overall balance, unless you start turning the dials on Voice Adjust once again. And vice versa. If you forget to change over from the Sports mode to Movie mode when watching a movie or another genre you will quickly notice that the upper treble range will start to distort as soon as you raise audio volume. It simply sounds annoying with lots of added noise. 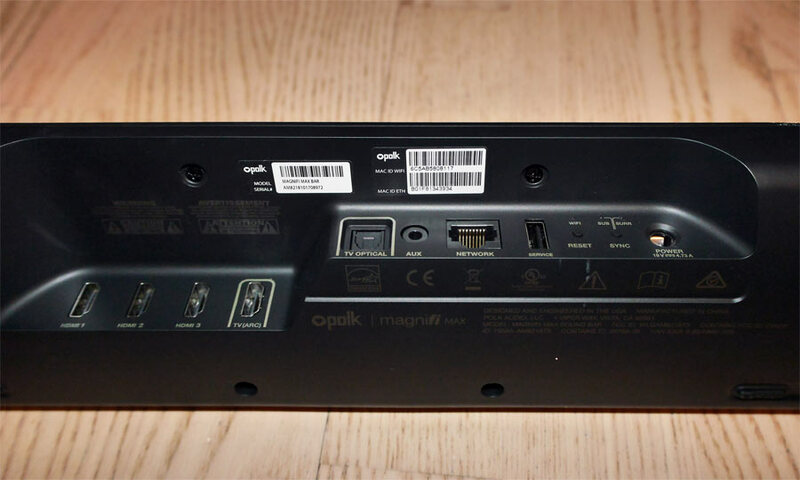 I do not consider it a critical problem but it is more evidence of Polk Audio having equipped MagniFi Max with inferior hardware. They should have implemented better units if they want to compete in this price class. For the purpose of testing music performance, I relied primarily on the built-in Chromecast function. Bluetooth was only used momentarily to confirm that it actually worked as intended. MagniFi Max is also compatible with Google Home, meaning that you can use your voice to control playback (Hi Google, Play music on Spotify etc.) and certain other things. The Google Home integration was not tested. I stuck to the manual way and started out with Eric Clapton’s Tears in Heaven in the ‘Unplugged’ live session version where the guitar and Clapton’s voice are in focus. His vocal sounded weak and almost miraculously Polk managed to sneak in some bass, which is not right. Throughout the 4-minute track, I just sat there wondering while listening to a song that I am very familiar with. The soundbar should be better than this – and it is. After the first round, I discovered that the soundbar was set to Movie mode. I immediately switched to Music mode, which meant that the unintended bass disappeared. The vocal now sounded a bit dusty and the music had more nuance, with natural “impurities” in Clapton’s voice – as intended. The music dynamic now felt more natural and the mid-tone was well tuned in Music mode. However, it still lacked spatiality. It is a live performance so it is meant to include some natural echo. The soundbar’s bass was put to the test with James Blake’s Limit To Your Love. It alternates between tight electronic basslines and rumble bass. MagniFi Max managed the latter but it failed to reproduce the tight bass with precision. This is not a big mystery because most soundbars are built primarily for movies, but it is nevertheless one of those test tracks that separates the wheat from the chaff, especially in this price class. Another stress test meant to test entirely different capabilities is Jeff Buckley’s Hallelujah where the high notes put any speaker to the test, along with Buckley’s overdramatic voice. Unfortunately, MagniFi Max sounded like it almost toned down the drama in his voice. That may be better suited for background music but it puts a real damper on the melancholic sphere that the sound is meant to radiate. Lastly, to confirm my findings in the high notes, I played Minnie Ripperton’s Lovin’ You on repeat. Her well-trained, slender voice did not exactly hit the highest notes cleanly – I mean with this soundbar. 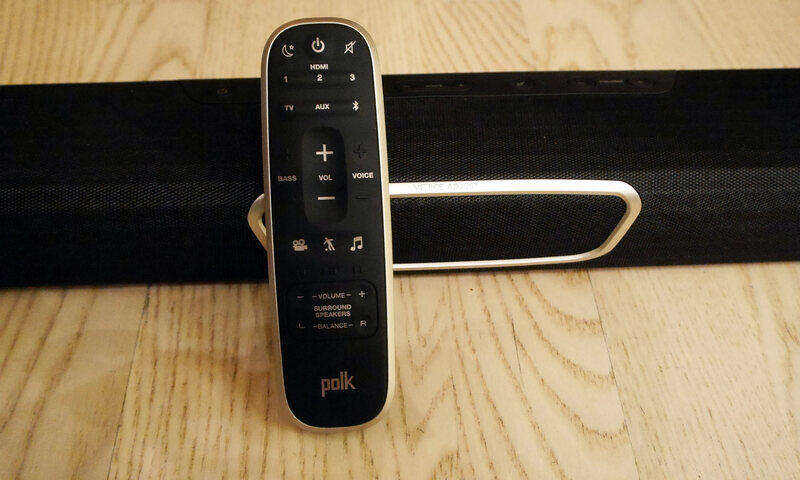 Modern soundbars such as Polk Audio can be firmware upgraded and as such the sound balance can be tweaked, and right before I was ready to conclude the test, the company issued an equalizer update for the Music mode. It slightly improved music balance but it still cannot match many competitors’ products in this class. Of course, it is great that the company is prepared to improve performance after the sale. Polk Audio’s MagniFi Max is a soundbar designed for mainstream movies. It performs well for day-to-day use, and it gets the job done, but it failed to convince in the area of music. If you are primarily into mainstream pop and rock for background music it may suffice, but if you prefer to sit down and enjoy the music I would suggest that you look elsewhere. There are better soundbars in this price segment. As a concluding note, I should probably say that there is no way to make MagniFi Max automatically change its audio mode to match the source (HDMI, Chromecast, Spotify). You have to do it manually and that is what tricked me initially. It just does not make sense that this is a general setting that ignores the source, especially not when the audio modes each are “colored” in different ways. Polk Audio MagniFi Max offers a large subwoofer with lots of punch and power while the soundbar still manages to looks slim and streamlined. 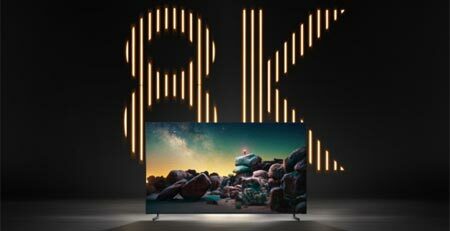 It is easy to set-up but still offers addition features such as built-in Chromecast and Google Home support as well as HDMI pass-through of 4K, HDR and Dolby Vision video. On the other hand there are only three HDMI inputs so if you prefer external devices for you entertainment, you will quickly run out of ports. The soundbar comes bundled with a small and nifty remote control that takes care of everything. It allows the user to switch between audio modes (Movie, Sport & Music). Unfortunately, there is no audio mode that offers neutral or balanced sound. It is a choice between three evils, each with its own characteristics that tend to twist things a little too much. When watching an action movie in ‘Movie’ mode you get big sound with lots of power and punchy bass but voices tend to drown in this violent power show. Polk Audio’s engineers have developed a feature called ‘Voice Adjust’ that lets you adjust, well, voices. While this can be handy, the center unit is simply of too low quality and too weak. The more you turn up the dial on Voice Adjust, the less accurate human voices become. MagniFi Max thrives as a casual soundbar for everyday TV watching. If you are looking for a soundbar to improve the audio experience when watching TV programs, and a movie from time to time, MagniFi Max is definitely not a bad choice. But if you watch mostly movies or if you like to listen to music, too, you should look elsewhere. MagniFi Max simply lacks precision in voices and the subwoofer is too inaccurate. All in all, Polk Audio’s MagniFi Max delivers sound that is too unbalanced, and the price is too high – at least outside of the US. Furthermore, the center speaker is low-quality and weak, and we think that the engineers should have spent more time implementing a balanced audio mode rather than three unbalanced audio modes.